Mike Brey, the men’s basketball coach at the University of Notre Dame, cited those qualities in the players he has recruited out of the Baltimore Catholic League during his keynote remarks Sept. 27 at the sixth annual gala celebrating Catholic education in the Archdiocese of Baltimore. They also serve as apt descriptions of the archdiocese as it nears the end of its 225th anniversary. 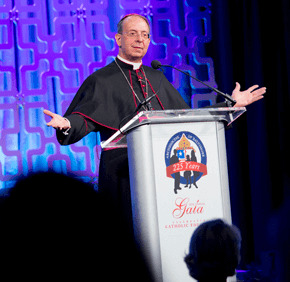 Archbishop William E. Lori used the occasion at the Baltimore Convention Center to announce that “Embracing Our Mission, Shaping Our Future,” the capital campaign begun in 2010 by his predecessor, Cardinal Edwin F. O’Brien, had raised $140 million, far exceeding its goal of $100 million. “From Pat Madden’s lips to God’s ears, we’re on our way to $150 million,” the archbishop said, relaying projections from the executive director of development for the archdiocese. “We have to make (Catholic education) more accessible for families, with tuition aid and transportation aid,” the archbishop said. This year’s gala raised more than $800,000, according to the Archdiocese of Baltimore’s website. He referenced the Maryland Education Credit, which would award education tax credits for businesses donating to schools. It has failed in past General Assembly sessions, but the Maryland Catholic Conference will continue to push that legislation in the 2015 session. Prior to dinner, approximately 700 guests were entertained by the Archdiocesan School Choir, which followed two hymns with two songs from “West Side Story.” Under the direction of Sarah Larson, the music director at The Seton Keough High School in Baltimore, the choir included students from seven schools, including Bishop Walsh in Cumberland. Guests learned the story of the Cuneo family, which sent seven daughters to The Catholic High School of Baltimore. Ensuing generations have continued to study at the parish schools of St. Michael the Archangel in Overlea and St. Ursula in Parkville, and Calvert Hall College High School and Loyola Blakefield, both in Towson. View a video on Catholic education produced by Storyfarm. They also heard testimonials from products of St. Mary’s High School in Annapolis, who portrayed some of the leading figures in the history of the archdiocese. Victoria Marshall and Lars Lindland, juniors at the school, portrayed St. Elizabeth Ann Seton and Cardinal James Gibbons, respectively, and Michael Ruttum, from the class of 2014, portrayed Archbishop John Carroll. Brey, the Notre Dame basketball coach, was an assistant at Duke University in the 1990s, when the Blue Devils recruited Steve Wojciechowski out of the former Cardinal Gibbons School. 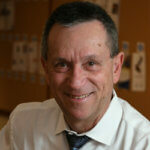 Wojciechowski is now the head coach at Marquette University, a Jesuit institution in Milwaukee. Brey’s captain at Notre Dame last season was Eric Atkins, a graduate of Mount St. Joseph High School in Irvington, who is now playing in Greece. Notre Dame’s current freshman class includes Martin Geben, the 2013 BCL Player of the Year for St. Maria Goretti in Hagerstown.